Sharon Wienberger at DANGER ROOM reminds me of this ridiculous horseshit. 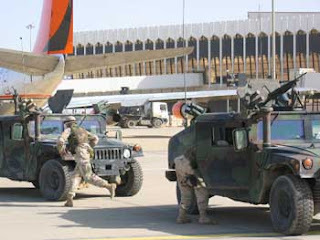 May 31 2003--WASHINGTON--Northwest Airlines soon could receive government permission to begin service to Baghdad, following Friday's announcement the United States is ending its nearly 13-year ban on flights to Iraq. Good times, good times. I wonder if Northwest has any flights to Palestine?